Casita Jocote is one of three permanent rental casitas, just outside of San Marcos set in colourful gardens and built of tradition adobe bricks, on a spectacular property that stretches from the San Marcos-Tzununa road down to the lake front. The property is an approx. 15-20 min walk from central San Marcos, and there is direct lake access and a private dock. The property is peaceful and secure, but close enough to all the great restaurants, bars, cafes and treatment clinics in San Marcos, and an approx. 45 min boat ride from the main transport hub and shopping/banking town of Panajachel (Pana). 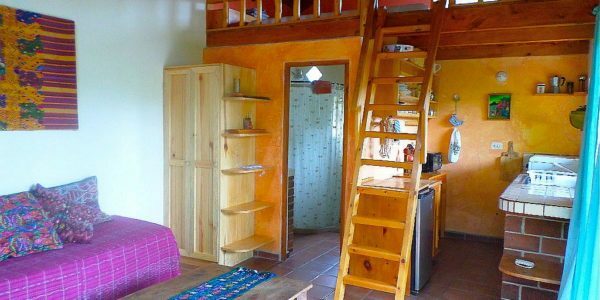 This casita is a studio with a bedroom and bathroom with shower inside with small, well-equipped kitchen and a gorgeous inside-outside seating area with spectacular views. The perfect spot for 1 person or a couple looking for tranquility in gorgeous surroundings. The property is set on a series of terraces some 200 steps up from the lake, these casitas offer some of the very best views of Lake Atitlan and the volcanoes! Each house if furnished and fully-equipped. There is road access, but pretty much everyone arrives at Lake Atitlan via Pana, and from there you get one of the public boats (lanchas) that ply back and forth every day from 6am to approx. 5-6pm to the public dock and then walk up to the main road and get a tuk tuk (5 mins in tuk tuk).